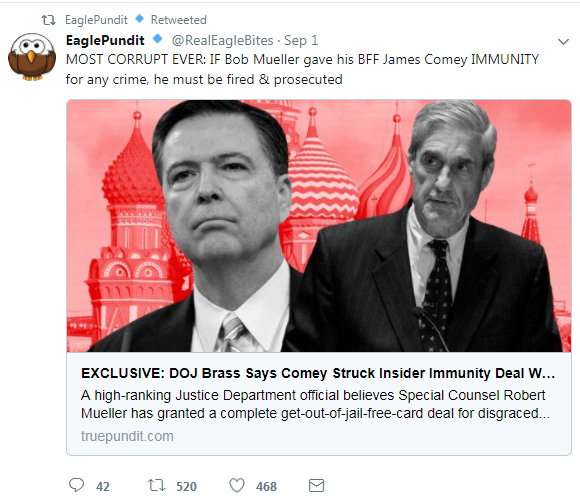 On January 2, Glenn Simpson and Peter Fritsch, the founders of the research firm Fusion GPS, claimed in an op-ed that the FBI had a source “inside the Trump camp” during the 2016 election. 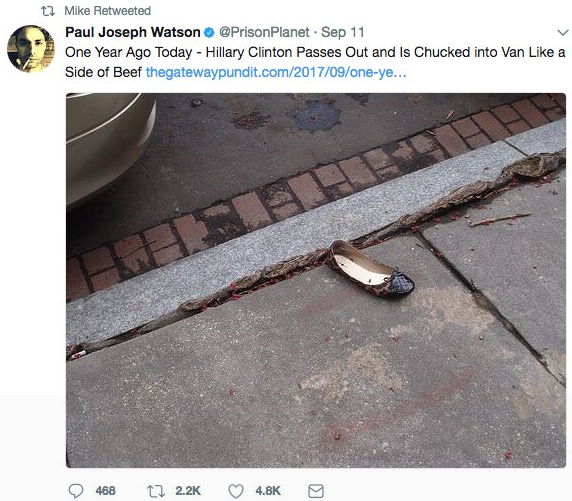 The same day, reporters tweeted that the Trump campaign insider Simpson referred to was George Papadopoulos, a foreign policy adviser to the campaign, and that the FBI's source was an Australian diplomat who informed U.S. officials that Papadopoulos had mentioned to him receiving Russian dirt on Hillary Clinton in May 2016. Between January 9 and January 10, both The New York Times and The Washington Post reported that the “human source” Simpson had mentioned was allegedly the Australian diplomat, Alexander Downer. 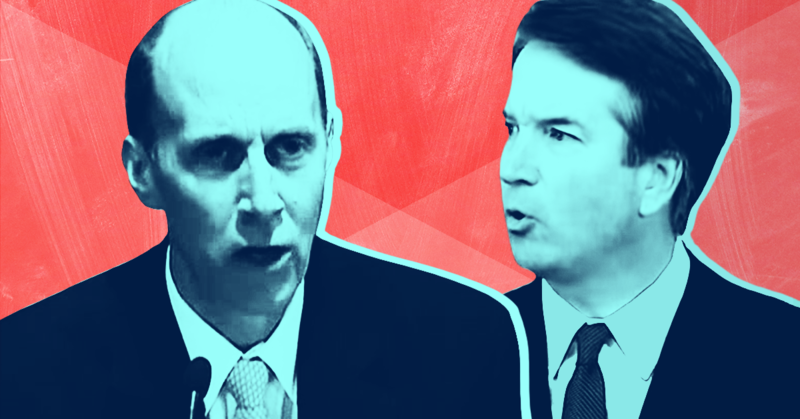 Two days later, The Wall Street Journal’s Kim Strassel published an op-ed in which she speculated that the FBI may have secretly had a source “who used his or her non-FBI credentials” to interact with the Trump campaign. Strassel wrote in the Journal that the DOJ and the FBI “outright hid critical information from a congressional investigation," which could mean that the FBI had a spy linked to the Trump campaign. Strassel wrote that “When government agencies refer to sources, they mean people who appear to be average citizens but use their profession or contacts to spy for the agency,” asserting that the FBI could have secretly planted a source who interacted with the Trump campaign. 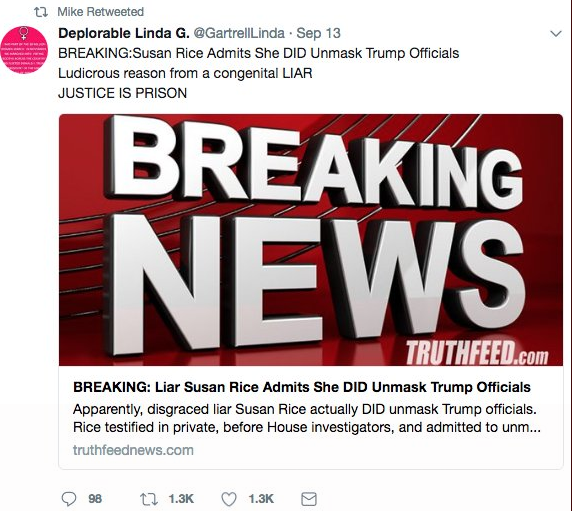 Strassel also concluded that "Now we find [the FBI] may have also been rolling out human intelligence, John Le Carré style, to infiltrate the Trump campaign." Radio host Rush Limbaugh claimed he knows “who the spy is” and that this person was “like an operative employed by the FBI to basically entrap somebody who worked with the Trump campaign in a peripheral way.” He also said that Papadopoulos “was entrapped by three people, including the person who is reputed to be the spy." 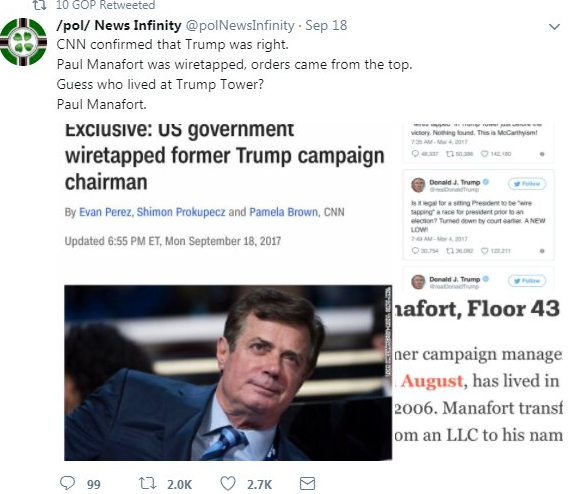 Pro-Trump site The Gateway Pundit ran multiple articles by founder Jim Hoft that pushed the claim, including one in which Hoft claimed to know the “probable” identity of the “spy,” and another that argued there were multiple “deep state” sources. 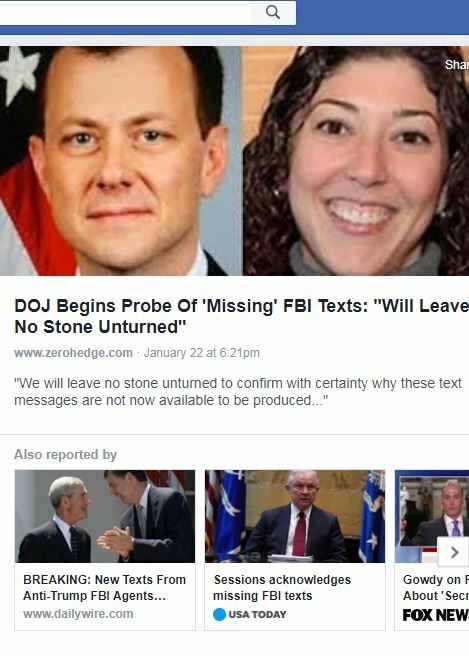 Far-right fringe blog Zero Hedge posted Strassel’s op-ed with the headline, “WSJ: The FBI Hid A Mole In The Trump Campaign,” even though Strassel never claimed the “mole” was actually inside the campaign. 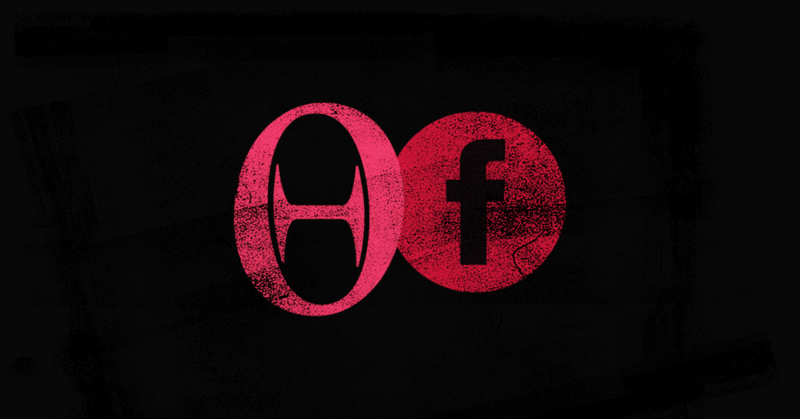 Facebook has repeatedly featured the blog Zero Hedge -- which is known for trafficking in conspiracy theories and misinformation -- on its pages for news Trending topics. 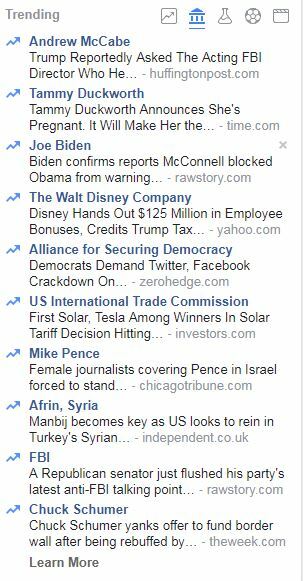 And at least once in the past week, the blog was the featured news source for a story on the Trending topics section of the news feed. Facebook has recently claimed it is taking steps to combat the spread of fake news and misinformation on its platform, which proliferated around and after the 2016 election cycle. 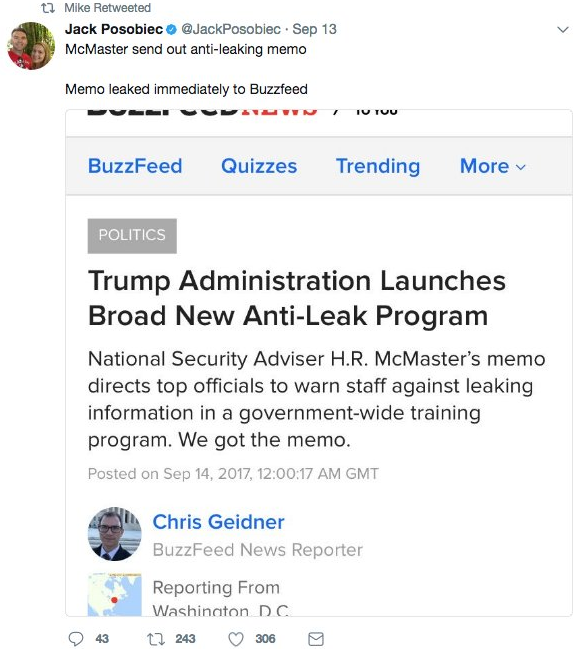 One of the key moments leading to Facebook’s misinformation problem was its decision in August 2016 to fire its “news curators” and put the Trending topics section under the control of an algorithm. The appearance of Zero Hedge as a news source in that section shows the algorithm is still struggling with curating credible news sources. 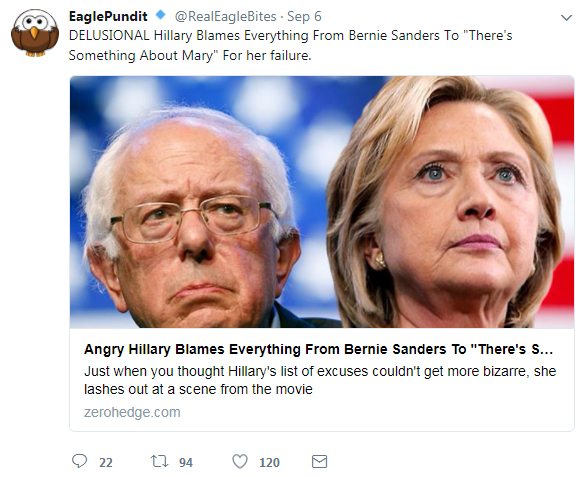 Zero Hedge was initially launched as a financial blog in 2009 and has repeatedly trafficked in the same ecosystem as The Gateway Pundit and Infowars. 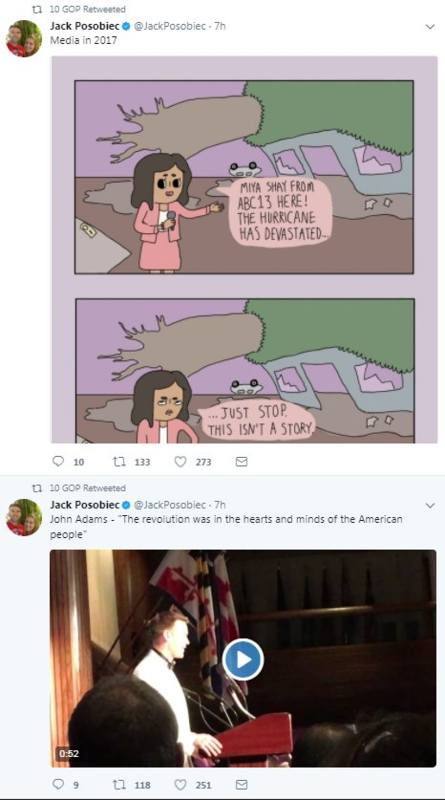 The latter two are conspiracy theory websites that, along with 4chan’s “politically incorrect” message board (commonly referred to as /pol/), are well known for spreading misinformation. 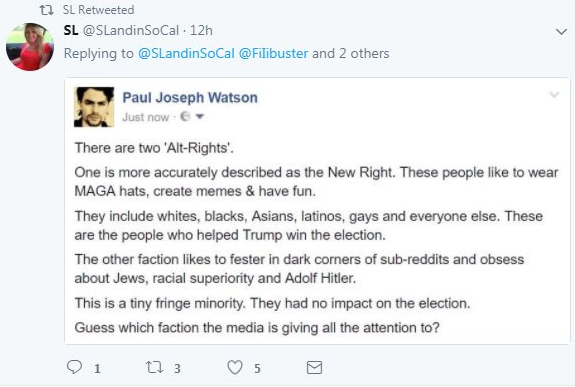 Infowars and Gateway Pundit have become so notorious that even some conservatives have spoken out against them. 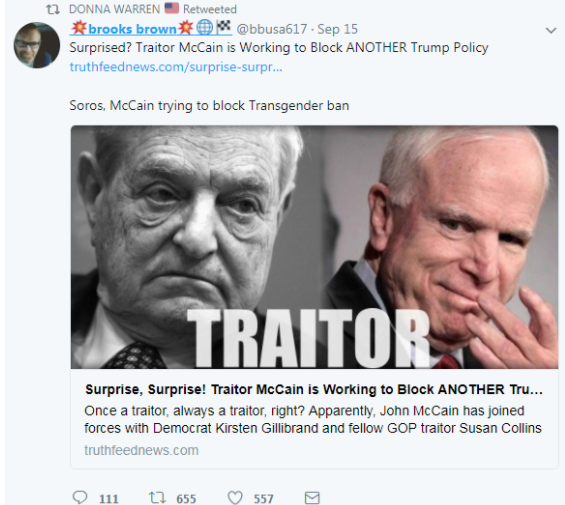 Zero Hedge sometimes pushes conspiracy theories from Gateway Pundit, and Infowars has also often taken stories from Zero Hedge to push conspiracy theories. 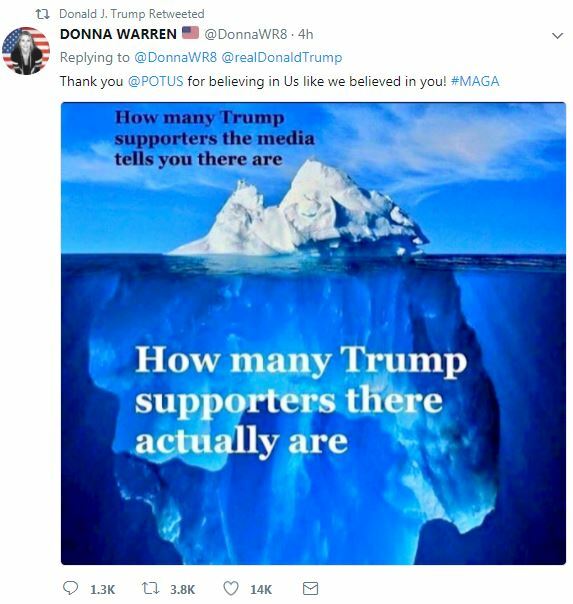 Infowars figures have also taken part in some of the same conspiracy theories as Zero Hedge. claiming former Attorney General Loretta Lynch was “busted” for secretly using an alias to communicate with DOJ officials, despite her action being both precedented in government and already public knowledge. 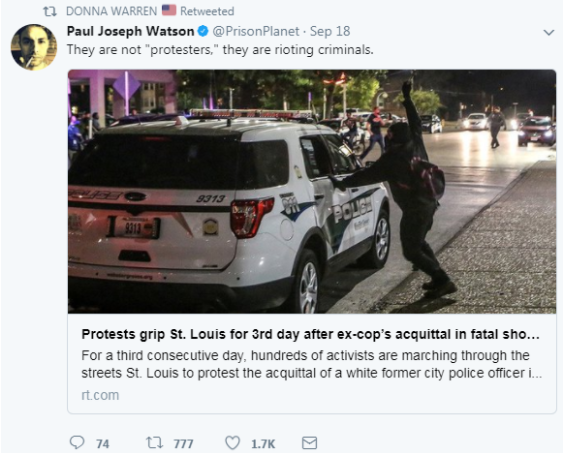 saying anti-Trump protesters were bused into cities after the 2016 election. 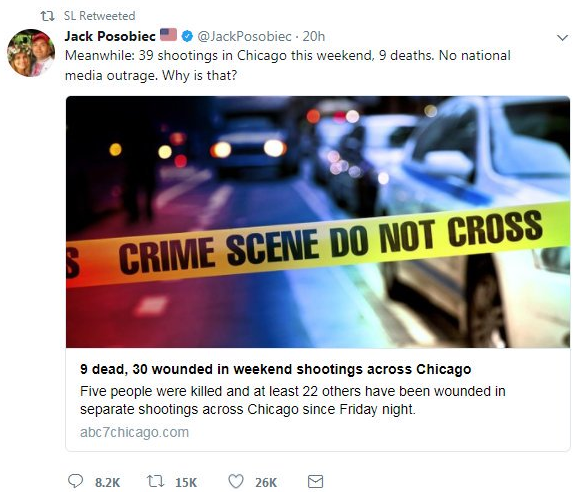 suggesting that a Bernie Sanders activist had been murdered in some kind of coverup. 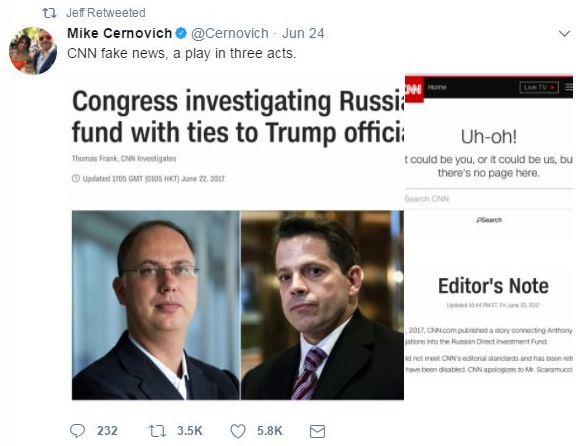 Additionally, Zero Hedge has pushed multiple false stories from fake news website YourNewsWire and from fake news website True Pundit. 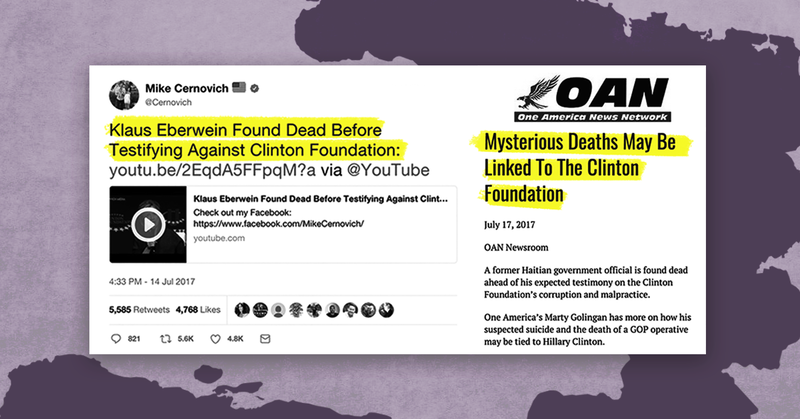 It also pushed the conspiracy theory known as Pizzagate, and repeatedly promoted conspiracy theories surrounding slain Democratic National Committee staffer Seth Rich. 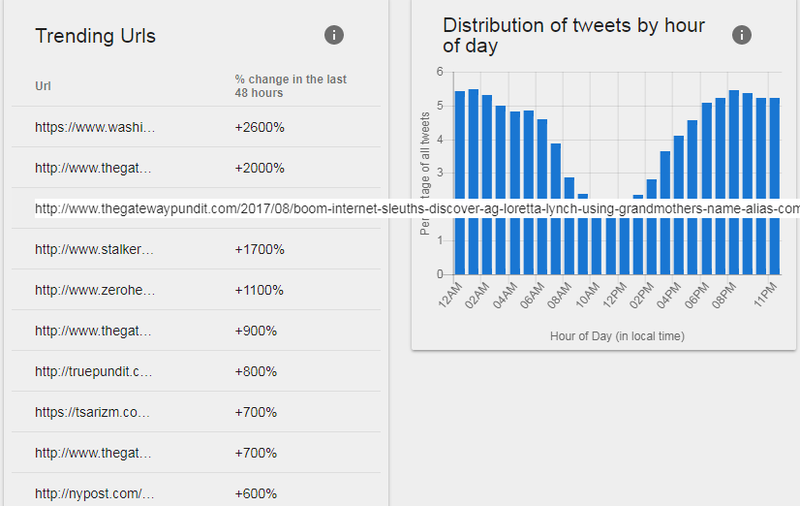 On January 24, the Trending topics section on the main news feed featured the blog as its top story about the Alliance for Securing Democracy (ASD), a think tank that tracks Russian influence online. 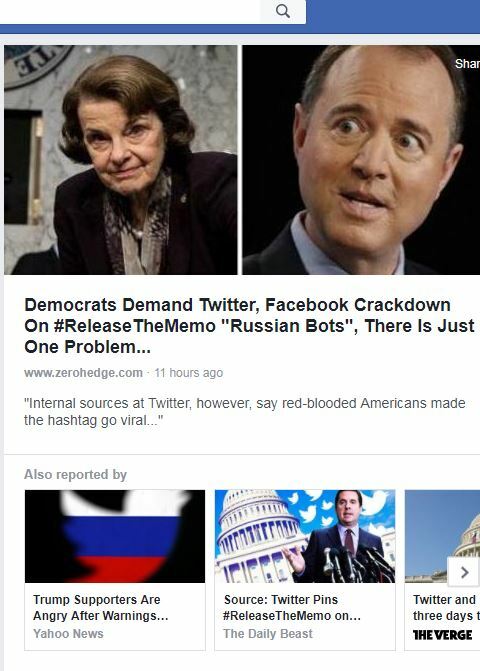 That Zero Hedge article criticized ASD for noting that Russian-linked accounts were pushing #ReleaseTheMemo, a campaign to get a memo written by House Republicans released that allegedly discredits the FBI’s investigation into Trump’s campaign. 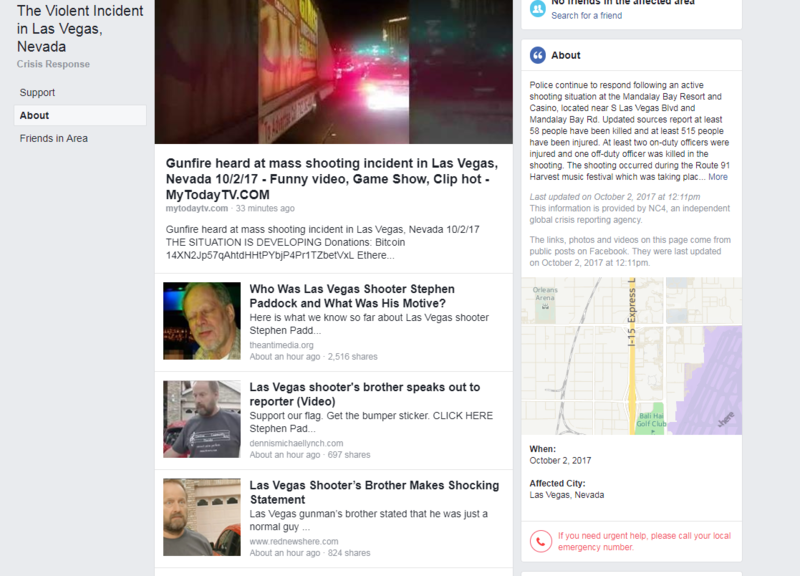 This is not the first time that Facebook has prominently promoted the blog; in October, the social media platform’s crisis response page for the Las Vegas, NV, mass shooting featured a link to an article from a site called antimedia.org that was a reprint of a Zero Hedge post. 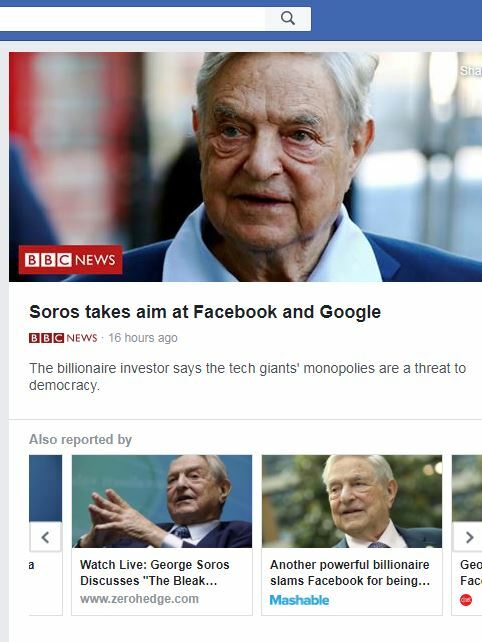 The risk of sites like Zero Hedge finding a platform in Facebook’s Trending news stories section became clear with Facebook’s announcement that it will rely on users to determine which sites are trustworthy: If users have been seeing a source trending often, they will be more likely to trust it when asked. 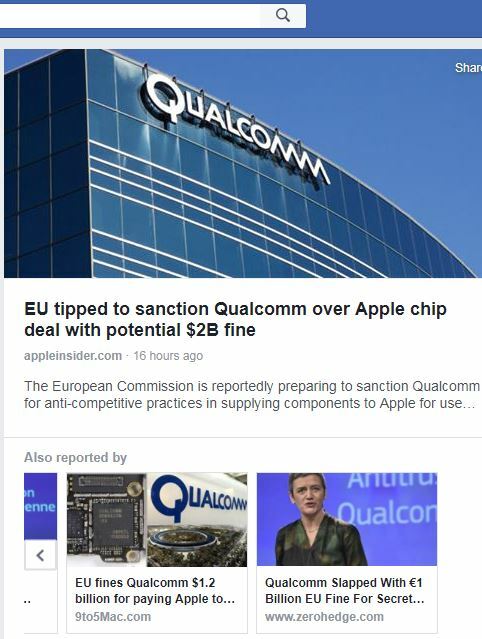 Facebook’s misinformation problem will continue to persist if it keeps giving a boost to outlets like Zero Hedge that regularly peddle misinformation. 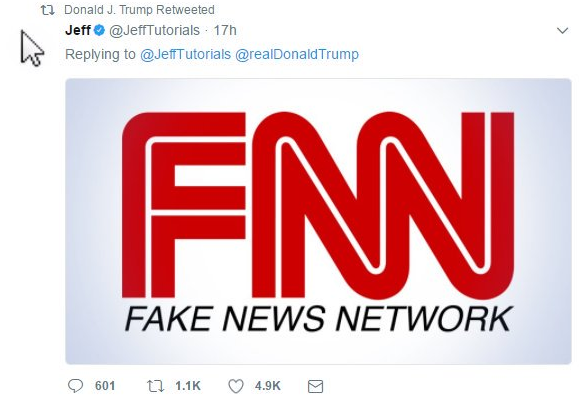 While the platform has made announcements in recent weeks that it claims will lessen the impact of misinformation on the news feed, the continuing problems of the Trending topics section promoting dubious websites as legitimate news sources are just as important. Nearly two years since it fired humans to curate its Trending topics, this section -- and the website as a whole -- continues to fail its users. 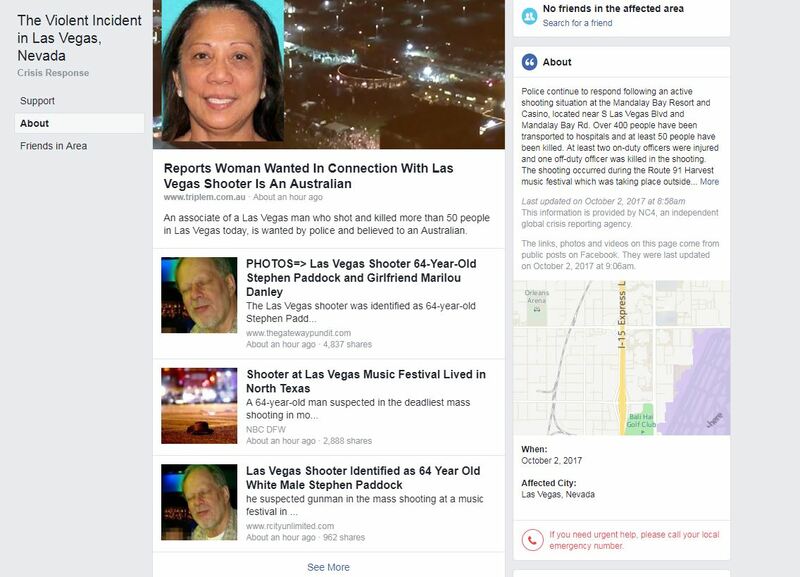 A page set up by Facebook to keep the public up to date on the October 1 Las Vegas shooting, along with searches on Google and YouTube regarding the shooting, show the struggle these platforms still have in combating fake and dubious news. 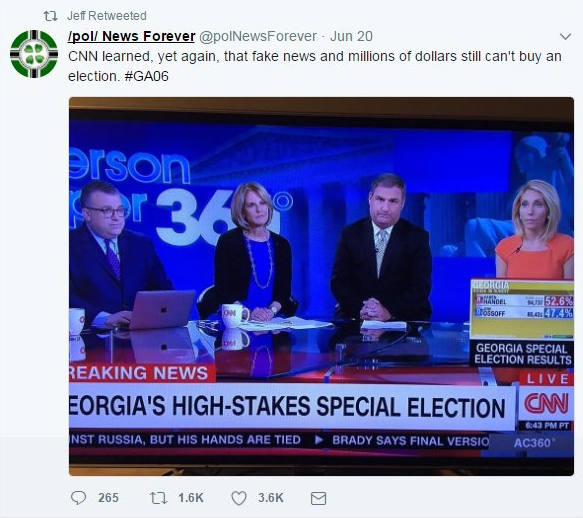 During the 2016 election campaign, fake news was widely shared on Facebook, including in its “trending topics” section. In response to intense criticism after the election, Facebook said it tried to take measures to limit the spread of fake news. 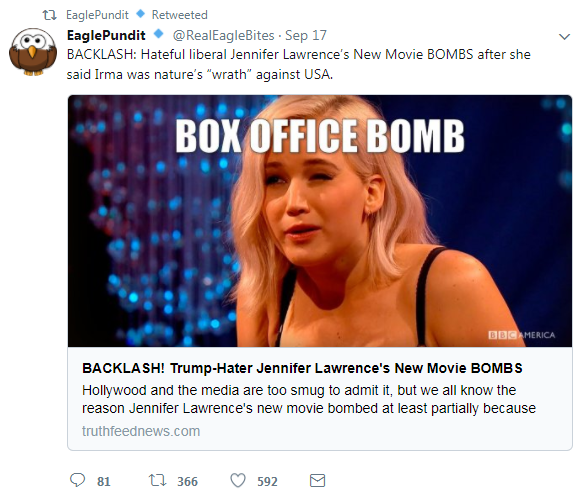 Yet the company disclosed in September that hundreds of fake Russian accounts bought tens of thousands of dollars worth of advertisements, and reports continue to come out about Russia’s use of Facebook to interfere in the election. Following a shooting on October 1 at a Las Vegas, NV, concert that killed at least 58 people, Facebook created a crisis response page called “The Violent Incident in Las Vegas, Nevada,” where people in the area could confirm that they were safe and users could find ways to support the victims. 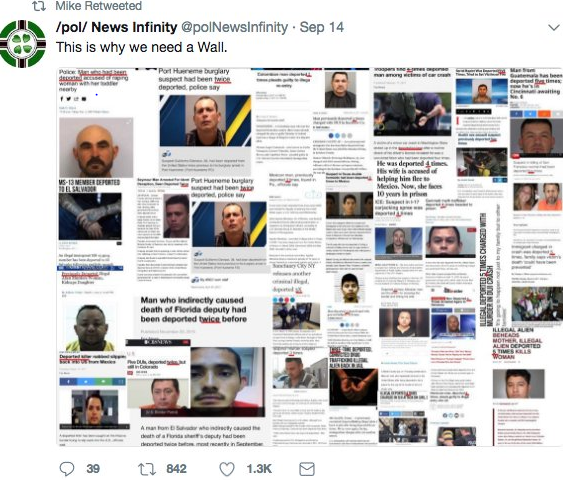 The page also has an “about” section with links to articles about the shooting, which seemed to appear and then disappear after a certain period of time. 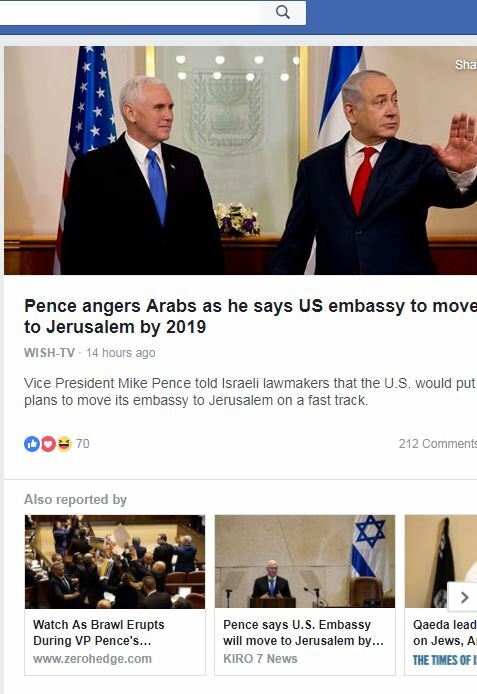 Facebook’s heavy use of algorithms appears to still be harming the website’s ability to block misinformation and nefarious usage of its platform. 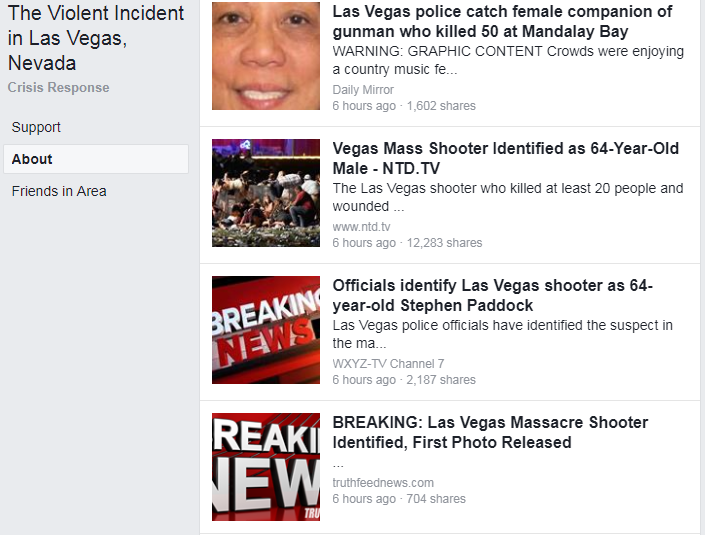 Besides its crisis page, Facebook's trending topic page for the shooting featured multiple articles from Sputnik, an outlet funded by the Russian government that is currently under investigation by the FBI for possibly violating the Foreign Agents Registration Act. 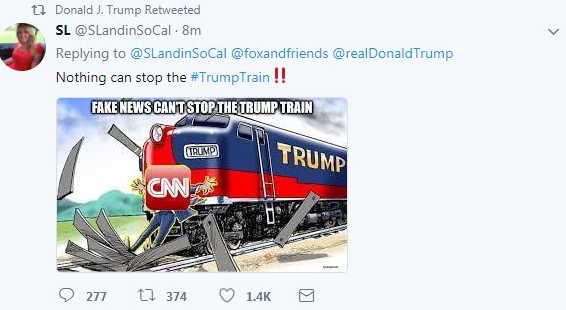 And Facebook is not the only platform having problems following the Las Vegas shooting. 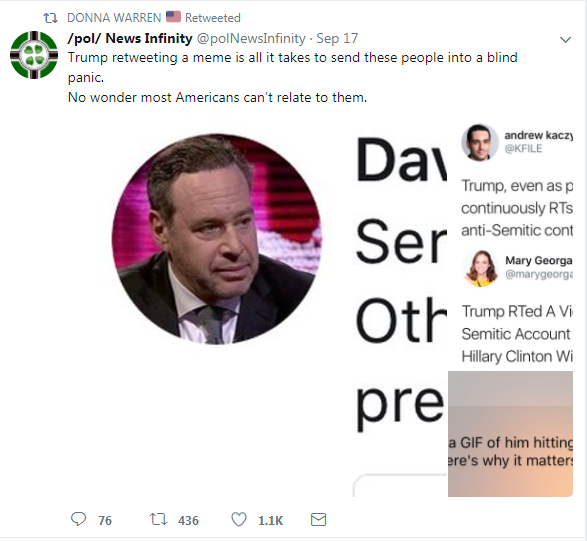 Google featured in its news section a false claim from 4chan's "politically incorrect" message board (commonly referred to as "/pol/"), which Google blamed on algorithms and absurdly referred to as a "4chan story." 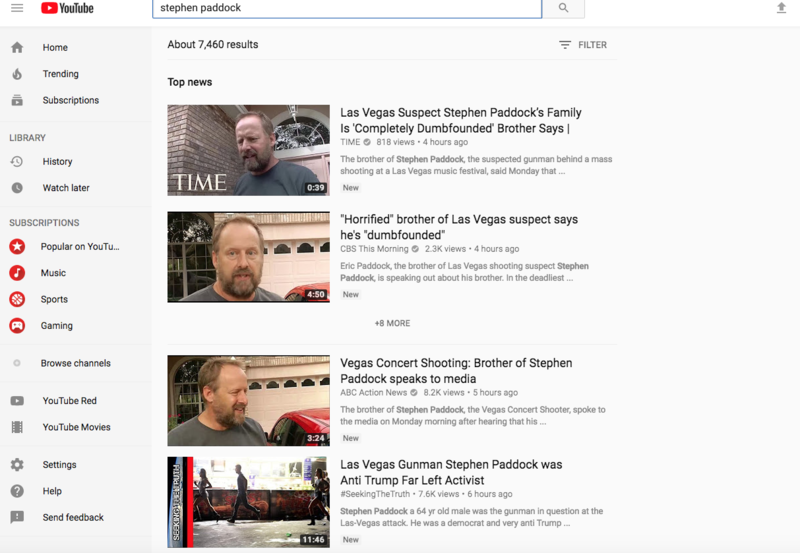 And on YouTube, which is owned by Google, a conspiracy theory that the Las Vegas shooter was an "Anti Trump Far Left Activist" is one of the top results if the alleged shooter's name is typed into the search bar. 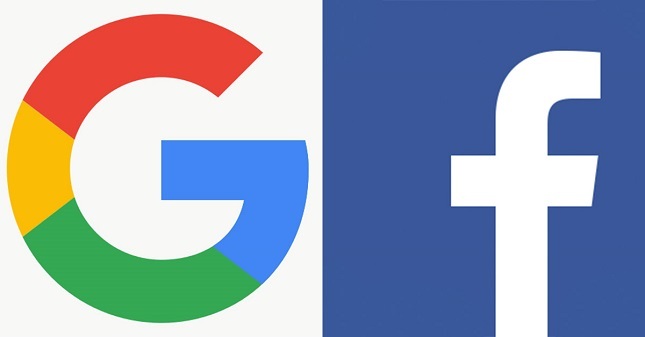 If Facebook and Google cannot get a handle on their misinformation problem, more dubious sources will continue to roam their platforms, earning wide exposure for their misinformation. 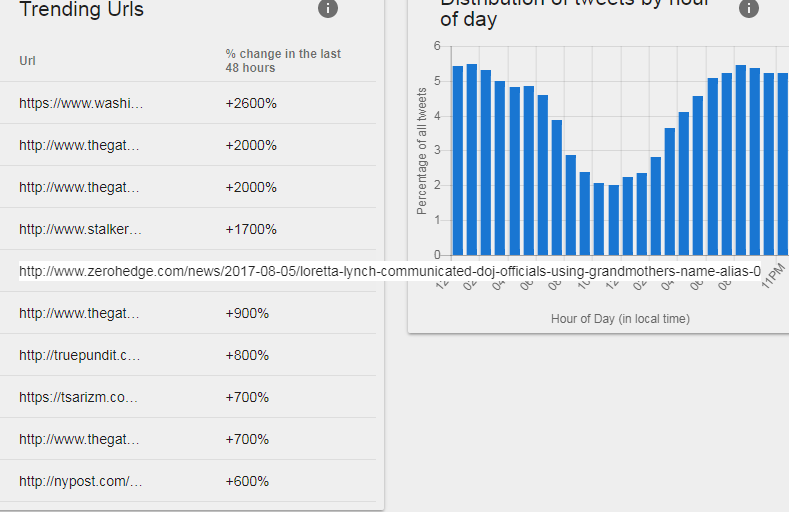 Fringe media figures and outlets that support President Donald Trump are trying to scandalize former Attorney General Loretta Lynch's use of an alias in her government emails, even though government officials have used the practice before, Lynch’s use of the alias had been disclosed last year, and the emails are still subject to records requests. 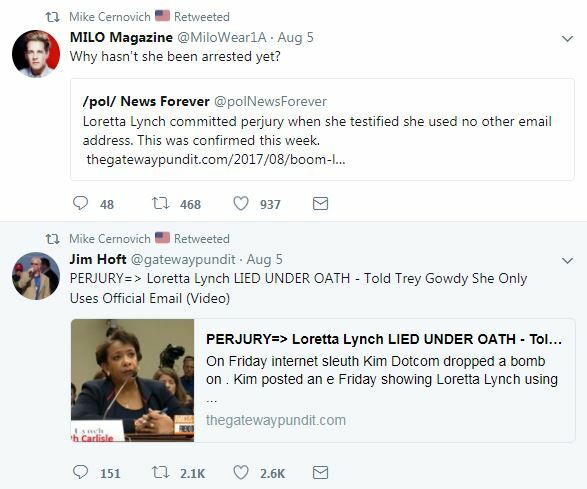 The implication of wrongdoing by Lynch then reached Jim Hoft of the pro-Trump website The Gateway Pundit, who wrote that “internet sleuth” Dotcom “dropped a bomb on Twitter,” and pointed to the “r/The_Donald” user who “discovered that Loretta Lynch used her grandmother’s maiden name ‘Lizzie Carlisle’ as her alias.” He added that Lynch “told Rep. Trey Gowdy (R-SC) under oath that she only uses official email in November 2016 — after these above emails were sent,” concluding, “Lynch committed perjury.” The allegation also reached far-right conspiracy theory outlet Zero Hedge, which claimed that Lynch “has been busted”; far-right trolls Mike Cernovich and Jack Posobiec; and discredited birther Jerome Corsi of the conspiracy theory website Infowars. A few also alleged that Lynch had committed perjury. Another forum known for pushing conspiracy theories, 4chan’s “/pol/,” also hyped the alias and perjury allegation. 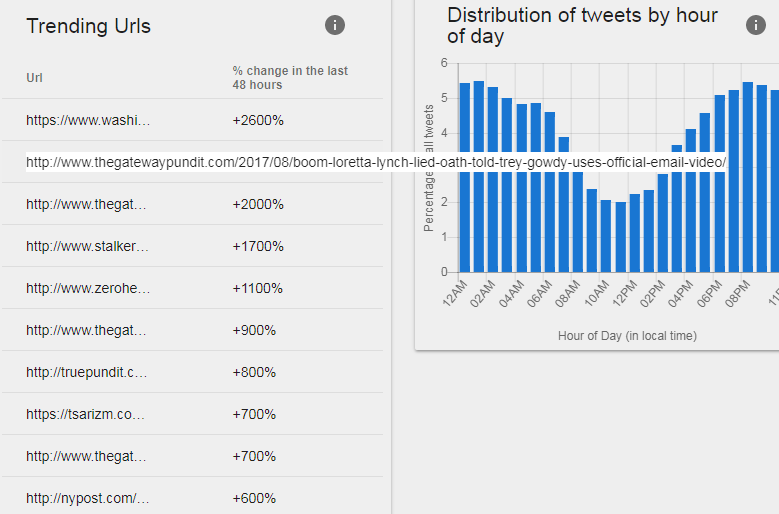 According to the think tank Alliance for Securing Democracy, which has a tool to track Russian-affiliated bots on Twitter, the stories targeting Lynch have been popular among those bots, which pushed both of The Gateway Pundit’s articles and Zero Hedge’s post. 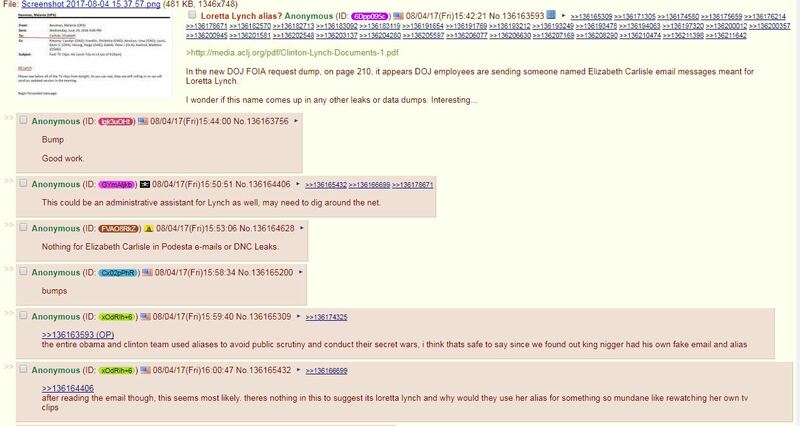 Despite the nefarious implications, it was already public knowledge that Lynch used an alias with her government email. Additionally, the practice was routine for previous government employees. 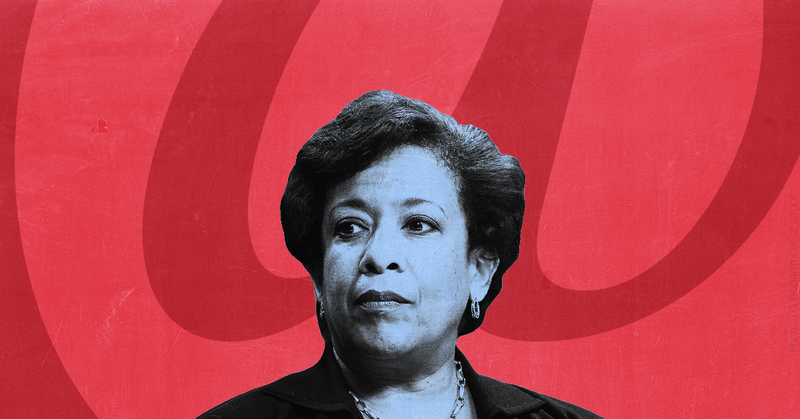 In February 2016, a Justice Department spokesperson said that Lynch “uses a government email account but also ‘does not use her given name in the handle of her email address,’” according to The Hill. In 2015, the Justice Department revealed that then-Attorney General Eric Holder used multiple email aliases in his government emails, and noted that because it was still a government email, “it is still preserved for recordkeeping.” (Indeed, this Lynch alias allegation came about specifically because ACLJ received the emails in a FOIA request.) Aides in President George W. Bush’s administration also used “secret alternate” addresses for emails, some of which were nongovernmental, according to Mother Jones. 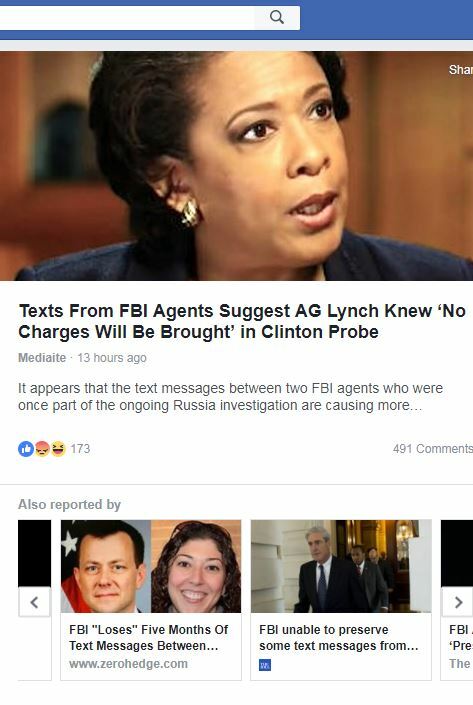 Multiple fake news purveyors also hyped allegations of wrongdoing, with Mad World News calling it a “smoking gun” against Lynch, TruthFeed writing that Lynch “lied under oath” in “a clear case of perjury, completely intentional,” America’s Freedom Fighters claiming Lynch is “heading to prison,” and Liberty Writers urging readers to “share this everywhere to help bring Loretta Lynch down.” Other previous purveyors of fake news hyping the allegation included RedStateWatcher, Freedom Daily, USA Politics Today, World Politicus, Patriots On The Right, and GOP The Daily Dose. 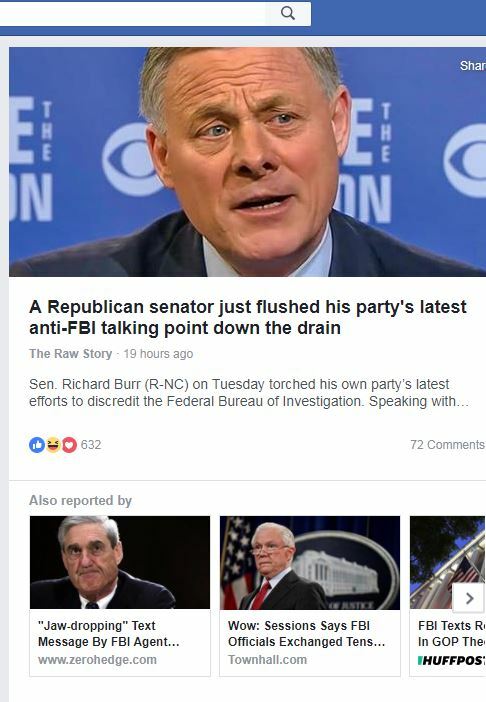 All of these articles drew attention on Facebook: The two Gateway Pundit articles had at least 15,900 and 9,100 engagements, respectively; the Zero Hedge article, 3,300; Mad World News, 1,000; TruthFeed, 4,100; America’s Freedom Fighters, 1,300; Liberty Writers, 12,800; RedStateWatcher, 809; Freedom Daily, 11,000; World Politicus, 1,100; and GOP The Daily Dose, 93, according to social media analytics website BuzzSumo. 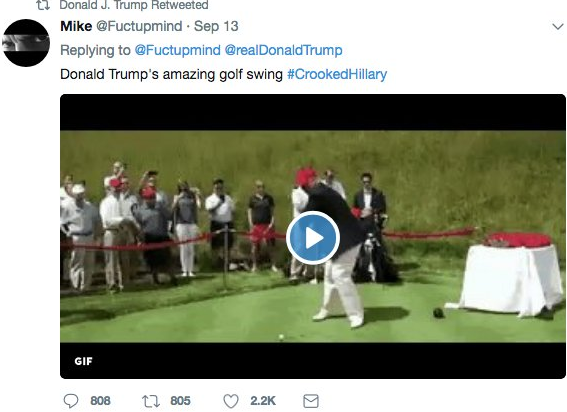 The far-right trolls, fringe outlets, and fake news purveyors teaming up to spread this allegation (aided by bots) provide yet another example of how fringe sources work together to spread dubious claims, conspiracy theories, and lies while attacking perceived enemies. 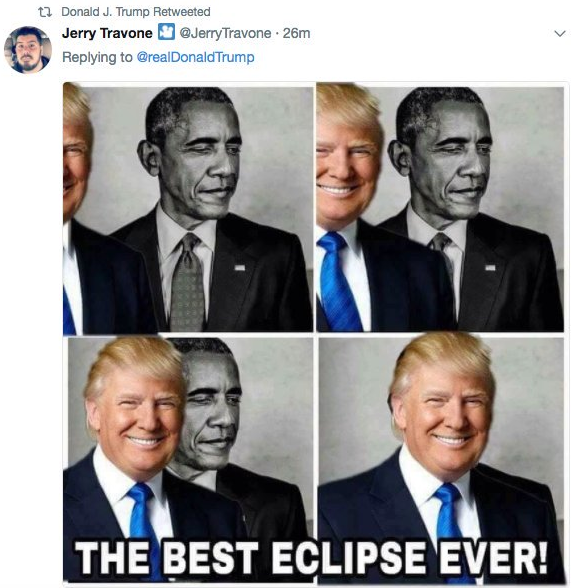 Right-wing media are hyping a survey that found the number of American adults without health insurance has increased “by some 2 million this year” and claiming that it shows the Affordable Care Act (ACA) is in a “death spiral.” But these reports fail to note that insurers have said uncertainty around the future of Obamacare -- caused by President Donald Trump and the Republican-led Congress -- has spurred premium increases and dwindling options in markets and that Republicans have been working for years to sabotage the law. Conservative media are reporting on a study claiming that thousands of illegal votes have been cast in Virginia since 1988. 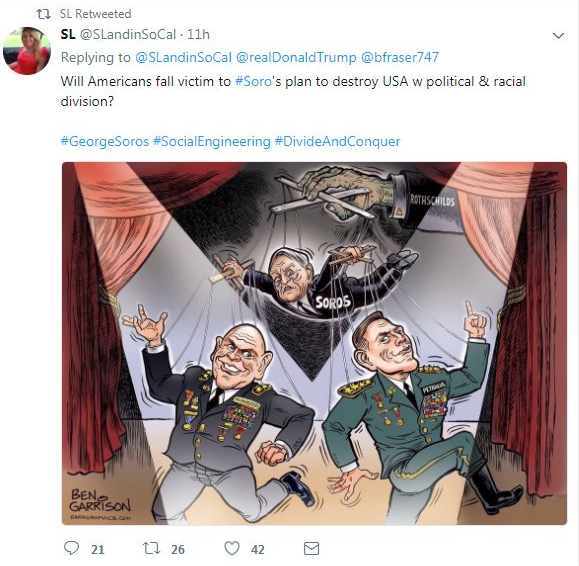 However, the study's authors have reportedly used “unreliable methodology” before, its findings go against those of several other studies and experts on voter fraud, and a person inaccurately targeted in it has called it a “gross misrepresentation of the facts.” Additionally, the study was put out by groups known for spreading conspiracy theories and fables about voter fraud and intimidation and which have previously used dubious methodologies in their studies. Forged documents originating on 4chan alleging that French presidential candidate Emmanuel Macron was evading taxes spread online thanks to an ecosystem that includes social media, “alt-right” outlets, and fake news purveyors. 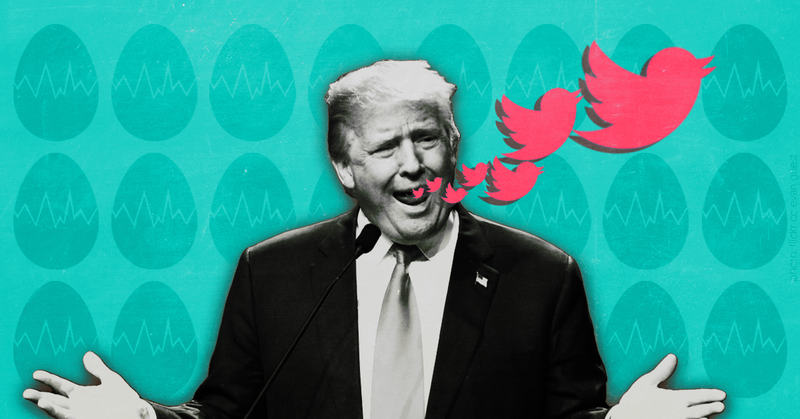 The campaign was seemingly aided by Russian-linked entities, and it subsequently reached Macron’s opponent, who aired the claim in a public debate. Macron is competing in a May 7 runoff against far-right candidate Marine Le Pen. On May 3, hours before a scheduled debate between Macron and Le Pen, an anonymous user on 4chan posted documents purporting to show that Macron used a shell company to dodge taxes. 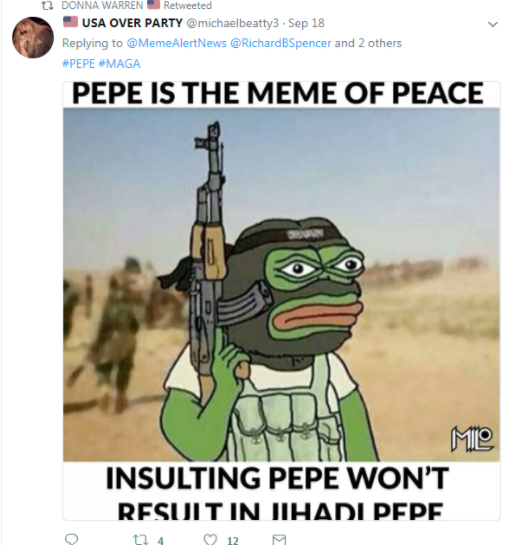 Users on the forum responded that the documents should be sent to “independent journalists” and “the alternative media” like “Cernovic (sic), Breitbart, and so on,” and encouraged each other to “spam” the documents “on social media” such as Twitter to get “it trending.” They also said to “send it to Le Pen.” The documents soon spread on Twitter, with many of the Twitter accounts promoting them appearing to have connections to Russia, according to a Belgian researcher. 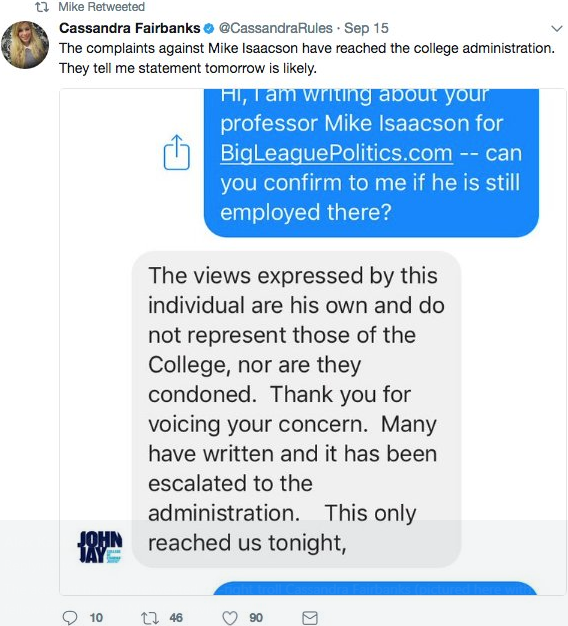 The claim was promoted by “alt-right” media figures such as Mike Cernovich and Jack Posobiec. 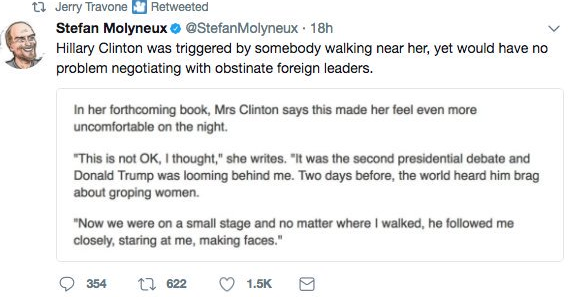 That these figures would attempt to smear Le Pen’s opponent is not surprising given that Le Pen is widely admired by much of the “alt-right” and closely tied with Russia. 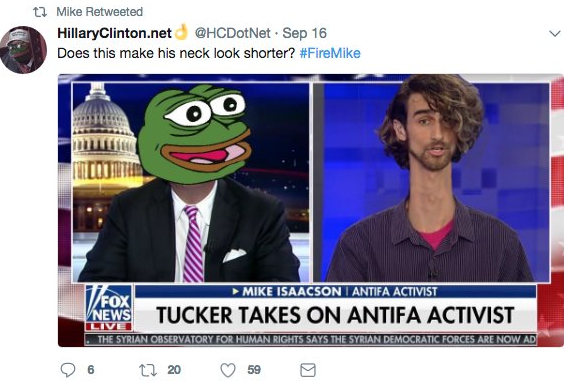 Along with Twitter, 4chan’s campaign was picked up by forums on 8chan and Reddit; “alt-right” fringe outlets The Gateway Pundit, Got News, Zero Hedge, and Daily Stormer; and fake news purveyor Before It’s News. 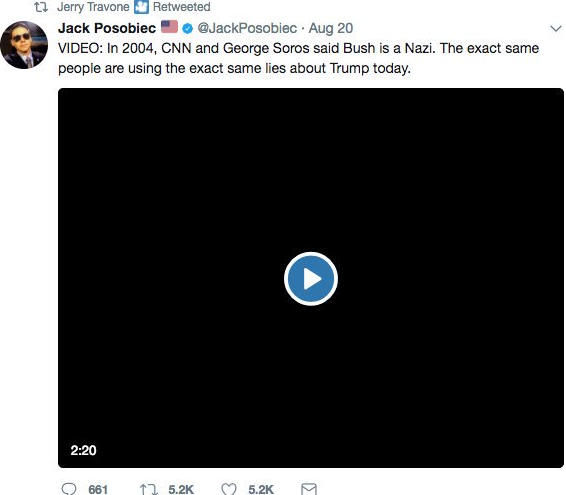 The case is yet another example of the way the misinformation ecosystem involving the “alt-right” and fake news purveyors amplifies fringe falsities and lies (and even Kremlin-connected conspiracy theories). 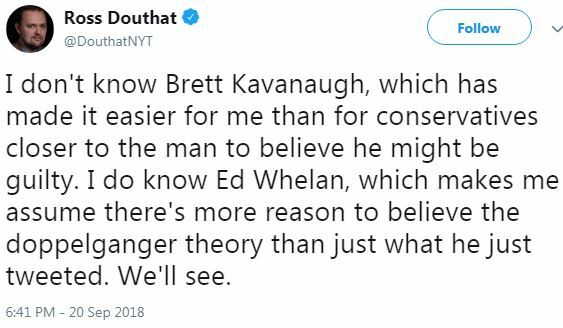 The network has often succeeded in pushing those false claims into more traditional conservative and mainstream outlets and, thus, the public realm. Labor rights advocates and progressive political activists commemorated May Day with marches in the United States and around the world in solidarity with immigrants and workers, but their mostly peaceful demonstrations were smeared by right-wing outlets, which painted them as violent outbursts led by anarchists. May 1 or May Day has been commemorated internationally as a workers rights holiday for over 100 years and this year it happened to roughly coincide with the culmination of President Donald Trump’s first 100 days in office. 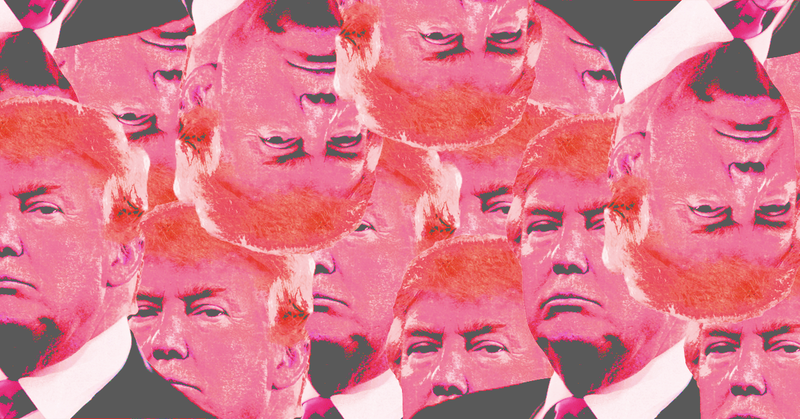 Trump’s tenure thus far has been typified by toxic anti-immigrant rhetoric and aggressively anti-worker policies and hundreds of thousands of activists peacefully marched this May Day in Washington, D.C. and across the country demonstrating their opposition to his agenda. While clashes broke out in some cities, most marches in the U.S. and around the world were peaceful. 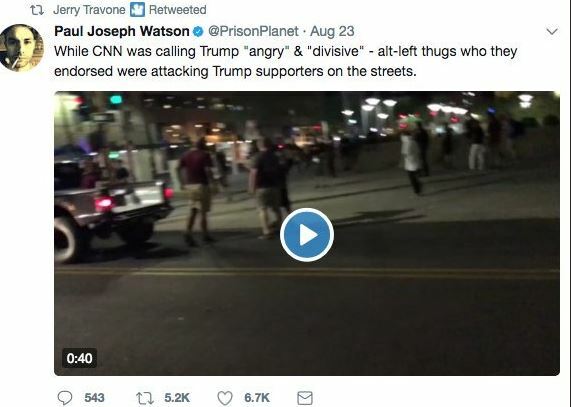 In response to the demonstrations, fringe right-wing outlets like The Gateway Pundit, ZeroHedge, and Infowars, along with the Russian government propaganda outlet RT, used the few isolated instances of violence to paint a picture that all protesters were violent communists and anarchists. 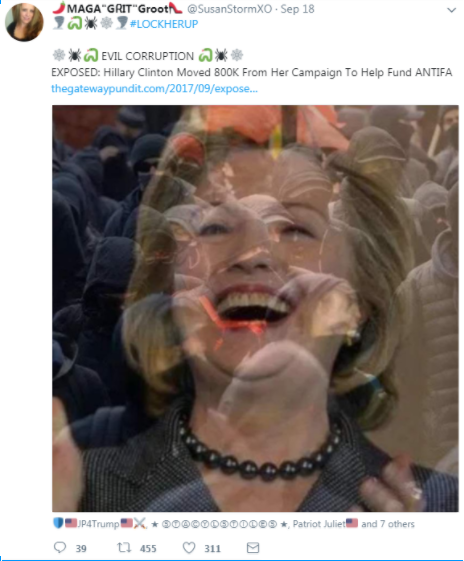 Right-wing conspiracy site WorldNetDaily warned, “Movements like this always end in death, poverty and misery.” Breitbart.com had a bevy of articles on May Day that claimed protesters were “radical left-wing activists,” alleged the crowd sizes at the protests did not live up to expectations, hyped violence that broke out in Portland as being endemic to other demonstrations and mocked Facebook for letting workers take the day off to join up with “communists and Black Bloc enforcers” at May Day protests.